After the first Thompson rebuilt Pacifics (the A2/2s) started to appear, Thompson designed a Pacific version of the V2. 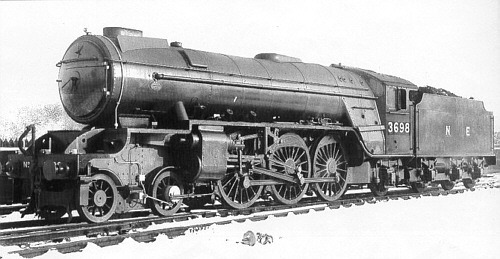 The front of this design was similar to the A2/2, with the bogie in-front of the outside cylinders and a separate set of Walschaerts valve gear for the centre cylinder. To standardise the new inside motion with that of the A2/2s, the coupled wheelbase was reduced. The V2's V-shaped cab was kept, along with the six-wheeled tender. The V2 boiler was also kept, although the pressure was increased to 225psi. This new design was given the designation of A2/1. Rather than rebuilding pre-existing locomotives, Thompson ordered the last four V2s to be built to the A2/1 design. These were built at Darlington, unlike the V2s which were all built at Doncaster. Construction of the A2/1s occurred during 1944 and was completed by January 1945. Compared to the V2s, the A2/1s had a number of innovations. The firebox had a rocking grate and hopper ashpan, which greatly simplified the process of dropping the fire and emptying the ash from the grate. Thompson also introduced an axle-driven alternator and electric lighting on the A2/1, which he later used on some of his other locomotive designs. The A2/1s were originally fitted with wing-type smoke deflectors. After the A2/3s appeared in 1946 with their large smoke deflectors, it was decided to replace these deflectors with the large kind. At an early stage, the standard 6-wheeled tenders were found to be too small. In 1945, No. 3696 was given the 8-wheeled tender from A4 No. 4469 Sir Ralph Wedgwood which had suffered irreparable bomb damage. The remaining three A2/1s received 8-wheeled tenders in 1949. The four A2/1s were split between England and Scotland, and usually worked express passenger and express goods trains. All four A2/1s were withdrawn between August 1960 and February 1961. The last A2/1 was withdrawn in 1961, and none survived into preservation. I am not aware of any models of the A2/1 in any scale. Thank you to the P.H. Groom collection for permission to use the above photograph of BR No. 60509 Waverley. Thank you to Malcolm Peirson for the above picture of No. 3698 with small wing smoke deflectors.